This web site provides a short introduction to Automated Crystal Orientation Microscopy (ACOM), a technique based on Backscatter Kikuchi Diffraction (BKD) in the Scanning Electron Microscope (SEM). • Backscatter Kikuchi Diffraction (BKD, EBSD). • A wealth of information is obtained about the crystallography and microstructure of bulk polycrystals. • The importance of crystal texture and materials' anisotropy has been generally realized. • Progress in low-light level camera and computer technology has enabled fast and automated systems. • Commercial systems are easy to operate. • Specimen preparation is relatively simple. • Scanning electron microscopes are widely available in many laboratories. Download Overview: Backscatter and transmission Kikuchi diffraction for materials science. The Diffraction of Cathode Rays by Calcite. The first EBSP was published by S. Nishikawa and S. Kikuchi in 1928. They directed a beam of 50 keV electrons from a gas discharge on a cleavage face of calcite at a grazing incidence of 6°. 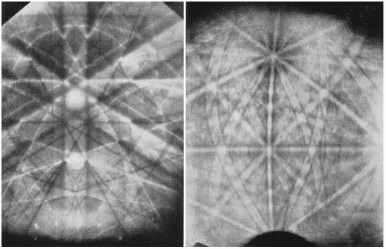 Diffraction patterns were recorded on photographic plates placed 6.4 cm behind the crystal, normal to the primary beam. The patterns consisted of pairs of parallel black and white lines, and in some cases contained diffraction spots in addition. 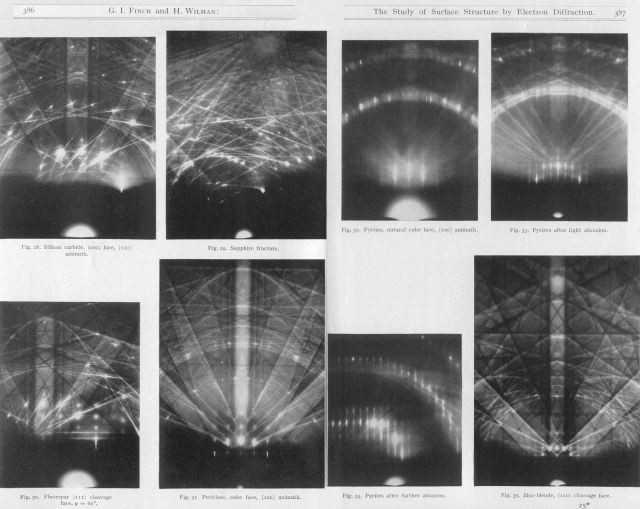 They were similar to those patterns obtained by S. Kikuchi in a transmission experiment on mica foils (first published in the same volume). When the photographic plates were placed in front of the specimen (parallel with the primary beam, as nowadays in modern "EBSD" set ups), the same type of pattern was observed as well "which must have been produced by the electrons deflected through an angle greater than 90°" . Since transmission and backscatter patterns were quite similar, they have been likewise interpreted and indexed. The relative intensities of high-order reflections were compared with those of X-ray diffraction. Cleavage faces of mica, topaz, zincblende and a natural face of quartz were also tried, and it was found that they give similar backscatter patterns. The authors called this new type of pattern "P-pattern" or "pattern of the fourth kind" (= "black and white lines in pairs due to multiple scattering and selective reflection"). They have later been named "transmission Kikuchi patterns" respectively " reflection Kikuchi patterns" or "backscatter Kikuchi patterns". The low quality of the first BKP may be caused by specimen contamination due to the poor vacuum facilities at that time. Diffraction of Cathode Rays by Calcite. In the following publications Seishi Kikuchi and Shigeo Nakagawa concentrated their studies on the deviation of the lines from the exact Bragg position caused by anomalous dispersion of crossing lines and the effect of the refractive index of the lattice on fast electrons. Already in 1928, Seishi Kikuchi (August 25, 1902 - November 12, 1974) grew fond of atomic physics. He published an investigation on the mode of disintegration of Radium (J. J. Phys. 4(1928) 143), made the acquaintance of Werner von Heisenberg on his visit to Japan, and joined for some time Heisenberg's team at the university of Leipzig (Germany). Back in Japan, starting in 1934 he installed a 600 kV Cockroft-Walton high-voltage generator, the most powerful at that time, and a charged particle accelerator at the (now) Osaka University Physical Science Department. Seishi Kikuchi is known as an outstanding Japanese nuclear physicist. Diffraction of cathode rays by single crystals. Part III. Kikuchi envelops are reported in backscatter Kikuchi patterns from cleaved calcspar (calcite, CaCO3) at 44 keV. In backscatter diffraction of fast electrons from rocksalt, sylvine, fluorspar, diamond, calcspar and quartz crystals, dark bands (on the photographic negative) have been reported that are bordered on both sides by (Kikuchi) lines. The bands were visible through acceptance angles up to 160°. The angle of beam incidence was varied between 3° and 30°, the beam voltage from 10 kV to 40 kV. The band width is proportional to 1/d (d = lattice spacing). Intensity profiles across two typical bands are sketched. Experiment showed that the bands are formed by backscattered electrons of virtually the same energy as the primary beam energy. The center lines of the bands - now called Kikuchi bands - have been indexed as zone circles sectioning the cylindrical recording film. Boersch studied thoroughly - in addition to transmission - also backscatter Kikuchi patterns (at 20 kV, about 5° of incidence and up to 162° of acceptance angle) obtained from cleaved, polished respectively etched NaCl, KCl, PbS, CaCO3, CaF2, quartz, mica, diamond, Cu and Fe surfaces. recorded on a cylindrical film at 20 kV. 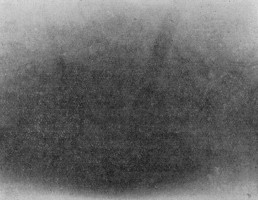 Boersch used flat photographic plates as well as a cylindrical specimen chamber with a cylindrical film to record high-angle Kikuchi patterns. The angular range is considerably larger than that obtained before in the TEM and in present SEM appliances. The patterns are remarkably sharp and rich in detail. The widths of the bands was found, in agreement with Bragg's law, to be related to the energy of the incident beam and the interplanar lattice spacings. Boersch has discussed the origin of Kikuchi lines, dark and bright bands and envelops taking von Laue's dynamical theory of electron diffraction into consideration. The study of surface structures by electron diffraction. In this review a collection of excellent backscatter Kikuchi patterns form a variety of single crystal cleavage faces have been presented. The intensity pattern outside a crystal due to a point source of charged particles inside the crystal was quantitatively explained by von Laue when he solved the problem of bands in patterns as observed by S. Kikuchi. Many examples of observed patterns and the theoretical development can be found in his book "Particle Waves and Their Interferences" (in German). After electrons are inelastically scattered the original spherical wave is considered as a superposition of several Bloch waves inside the crystal, taking appropriate boundary conditions at the crystal surface and absorption by imaginary structure potentials into account to determine the intensity pattern outside. The formation of Kikuchi envelops is treated without using the reciprocity law as well as in a rigorous wave-dynamical treatment based on the reciprocity law, a one dimensional and a three dimensional periodic crystal lattice. A good agreement of both features, surface lattice envelops and crystal lattice envelops, with experimental findings has been obtained. The formation of Kikuchi patterns is treated by using the reciprocity law and solving the Schrödinger equation for bound electrons in the three dimensional crystal potential. This approach of dynamical theory of electron diffraction leads to a good agreement of the intensity profile and location of Kikuchi bands with experimental results. Kossel patterns in X-ray diffraction closely correspond to Kikuchi patterns in electron diffraction. If they are generated with hard X-rays of, for instance, higher than 100 keV energy when X-ray wavelengths are in the range of the wavelengths of electrons in the SEM, the Kossel cones degenerate into almost straight lines so that these Kossel patterns look very similar to Kikuchi patterns. Gitterquell-Interferenzen harter Röntgen-Bremsstrahlung. (in German). Diffraction of ions, such as protons or He+, by single crystals can as well generate patterns very similar to Kikuchi patterns. They are known as Ion Blocking Patterns. A cylindrical specimen chamber and camera have been used to study high-angle Kikuchi patterns obtained by reflection of electrons, of energy 6 to 50 keV, from the cleavage surfaces of crystals with the sodium chloride structure. Angles of scattering ranging from 0° to 164° were covered. The relative intensity of the patterns at different scattering angles was measured using a photographic technique. The intensity distribution was found to become less steep as the energy of the incident electrons decreased. In photographs taken with a large value of the glancing angle of incidence, defect bands were found, starting near the shadow edge of the pattern. These changed to excess bands at higher angles of scattering. The most striking feature of the results is the remarkable intensity and clarity at the highest scattering angles of the patterns produced by crystals such as lead sulphide and potassium iodide, the constituents of which have a relatively high elastic scattering cross-section. In marked contrast, a relatively low intensity and low clarity was found at these angles for lithium fluoride under the same experimental conditions. An investigation of the width of Kikuchi bands, visible over the whole available angular range, showed that the electrons forming these bands had the same energy as that of the incident electrons within the experimental error of 10%. A possible mechanism is discussed by means of which electrons can be diffused through large angles with high efficiency, relative to small angles, and with relatively little loss of energy. Video camera attached to the SEM. They have coined the new term "EBSP" (= Electron BackScatter Patterns) for backscatter Kikuchi patterns. The user had to identify and locate 3 zone axes on the screen, then the program calculated the rotation matrix; feasible for cubic crystal symmetry. The user had to mark interactively 3 or more bands to automatically index the pattern. "OIM": mechanical stage scan; Burns algorithm, Hough transform. Thorough investigation of the Hough transform for automated EBSD. Intensified CCD camera, interactive measurement of BKD band positions with the cursor on the monitor screen, automated indexing and orientation calculation. Modified ORKID/TEM version, supports all crystal symmetries.
. Pattern quality computed from RT and 1D FFT. EBSD detector employed as a multi-array detector to construct microstructure images which reveal topographic, material Z as well as lattice directional contrast during the acquisition of pattern sequences on-line or off-line in FastEBSD (see Poster Kiel 2011 ).